Blend for 1-2 minutes on high, until frothy. Swap the orange juice concentrate for frozen orange pineapple or piña colada mix for a tasty twist. There were three food places we’d always hit whenever my mama took us to the mall as kids. First, there was Hot Dog on a Stick. But never for hot dogs. No, mom was obsessed with the cheese on a stick, and she’d let us get them as pre-shopping fuel. And we ate those fried cheese sticks like they were the last meal of our lives. Second, there was always a stop at See’s Candies. The ladies in white, working the countertop, would dole out one sweet piece of chocolate for taste-testing while mom stood over the countertop and picked out her pound of favorite chocolates. Which brings us to the third and final stop: Orange Julius™. Big, frothy cups of sweet orange nectar. Mom loved it as much as we did. She’d usually buy one big cup and we’d all share. But if we were really, really, reeeeally good, she’s let us each have a glass of our own. Of course, the moment I hit college and realized 1) I could not afford a $5 glass of creamy orange juice and 2) how many dagnabbed calories were in the mall stuff, I knew I’d have to make a DIY swap. And so, I poured all that mall-shopping-with-mom passion into the blender, swapped out a few ingredients and made a darned yummy DIY version. My kids came home from school just as it was coming outta the blender. I grabbed three glasses from the cupboards. Pour everyone a hearty helping. Slipped plastic straws into each. 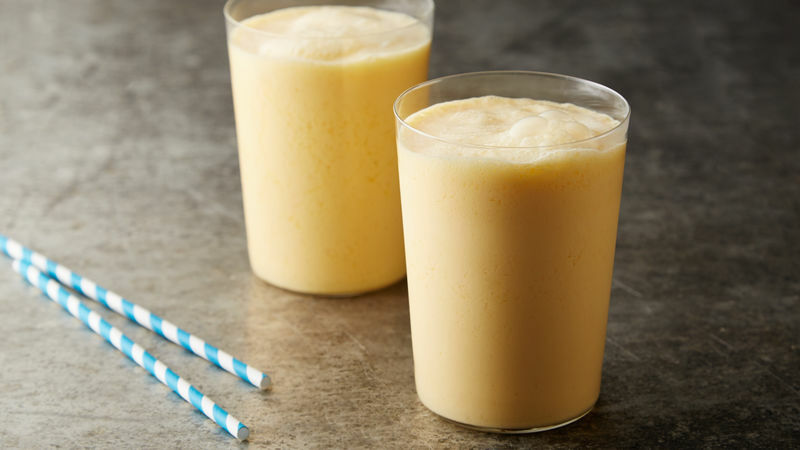 And we sat there and sipped and hummed and yummed—them, because this recipe is that good, and me, because finally, I could enjoy the taste of an Orange Julius™ without having to survive shopping. Win-win.